Indo-German Expert Workshop: IoT Device Security: What Role for Standards and Certification? Read more … Indo-German Expert Workshop: IoT Device Security: What Role for Standards and Certification? 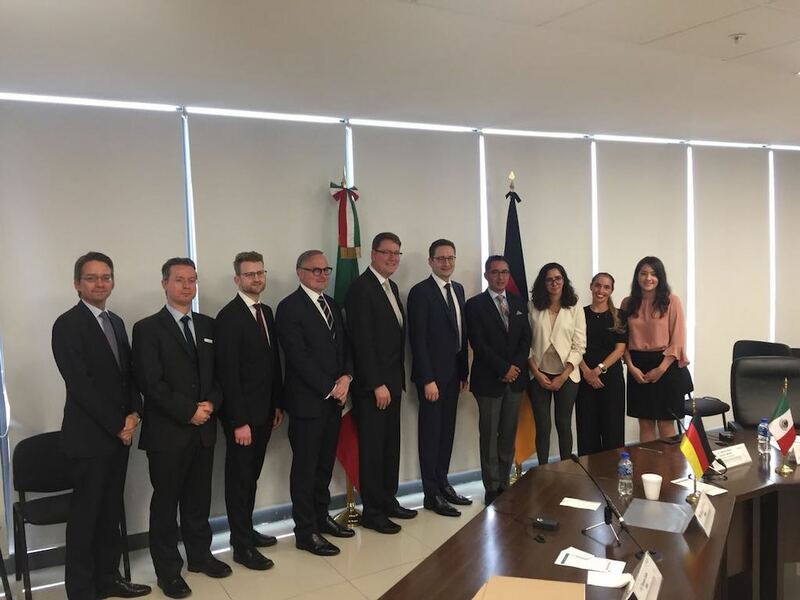 The German Government conducts bilateral political and technical dialogues with Brazil, China, India and Mexico in order to align and harmonise the regulatory and technical trading conditions with these countries. Among other things, the dialogues focus on standards and norms, differing testing and certification requirements as well as product safety controls. The Global Project Quality Infrastructure (GPQI) of the Federal Ministry for Economic Affairs and Energy (BMWi) brings together political decision-makers with business representatives and stakeholders from industry associations, chambers and specialist institutions. By organising political and technical exchanges and implementing jointly agreed measures, GPQI facilitates the development of coherent quality infrastructures, which are an important prerequisite for fair and efficient trade and product safety. Well-functioning and internationally coherent quality infrastructures also form an important basis for technical innovation and development. Therefore, GPQI is also engaged in supporting and coordinating coherent regulatory frameworks in innovative fields such as Industry 4.0, electric mobility and artificial intelligence. The Department of Telecommunications (DoT) of the Indian Ministry of Communications issued a notification on 12 March 2019 to extend the enforcement date of the mandatory testing and certification of telecommunications equipment (MTCTE) to 1 August 2019. The Bureau of Indian Standards (BIS) launched a website that allows viewing Indian Standards, which are made mandatory through Quality Control Orders (QCOs), free of cost. The Bureau of Indian Standards (BIS) informed about a range of products for which a future mandatory certification is currently under process in India. In addition to being India’s national standards body, the BIS is also responsible for several voluntary and mandatory certification schemes. 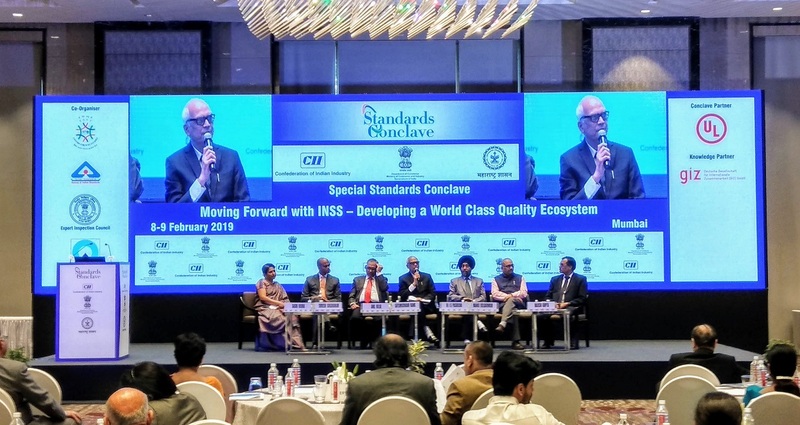 The Special Standards Conclave organised by the Indian Department of Commerce (DoC) and the Confederation of Indian Industry (CII) took place on 8th and 9th of February 2019 in Mumbai. After last year’s launch of the Indian National Strategy for Standardization (INSS), government officials and experts used this year’s forum to discuss its implementation. A National Action Plan for the implementation of the INSS is planned to be released in the next months. 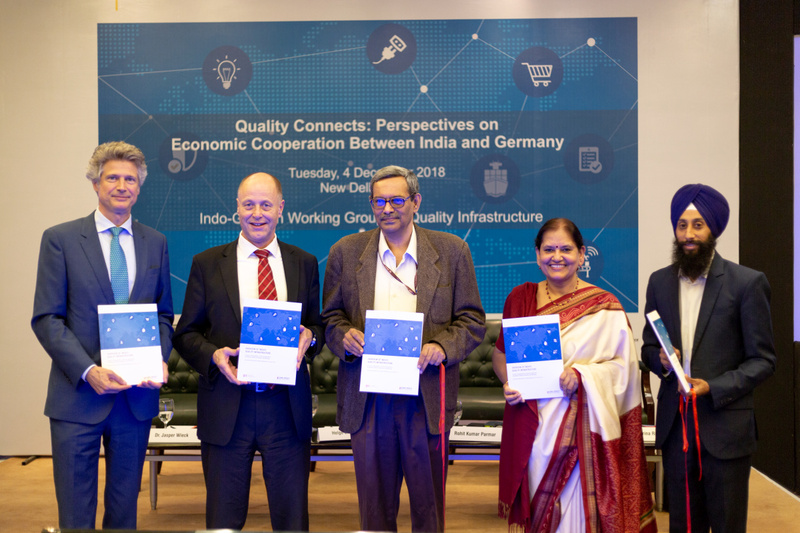 The sixth annual meeting of the Indo-German Working Group on Quality Infrastructure took place on 17 and 18 January 2019 in Berlin. 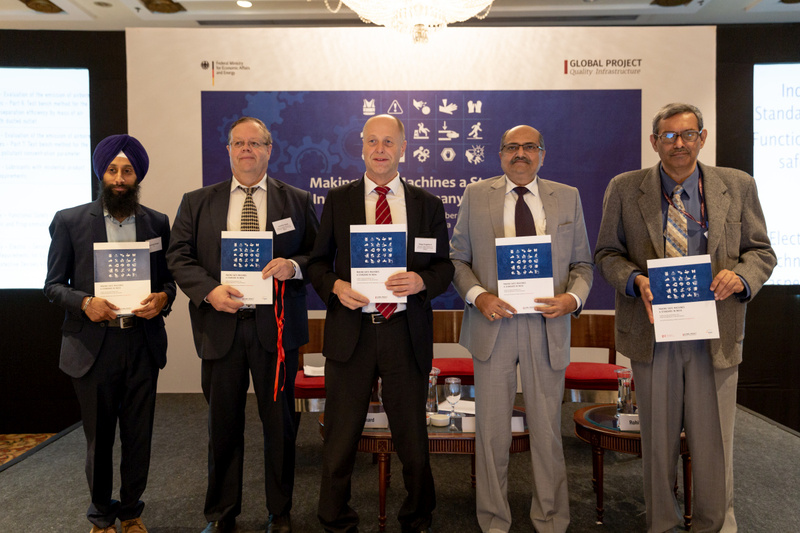 Germany and India founded the working group in 2013 to strengthen their economic and technical cooperation, reduce technical barriers to trade and increase product safety. Das Staatliche Zentralamt für Marktregulierung (SAMR) sowie die Zollverwaltung (GACC) haben am 30. Oktober eine gemeinsame Erklärung herausgegeben, in der eine enge Zusammenarbeit zwischen den Behörden bei Rückrufprozessen für defekte Importgüter angekündigt wird. The question how to strengthen market surveillance is of rising importance in India. In June 2018, the Indian government released the Indian National Strategy for Standardization, which includes the goal to establish an effective market surveillance system. 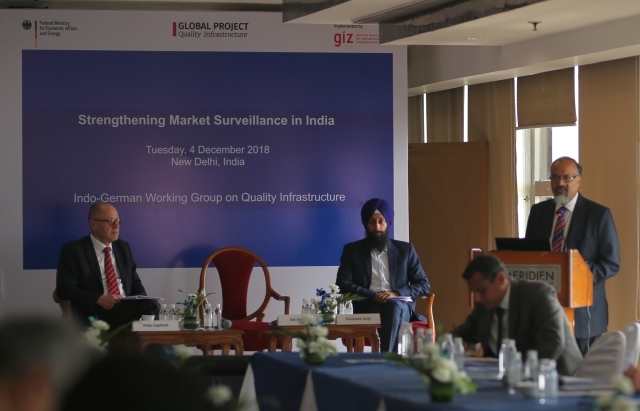 Against this background, the Global Project Quality Infrastructure organised a workshop on market surveillance in New Delhi on 4 December. 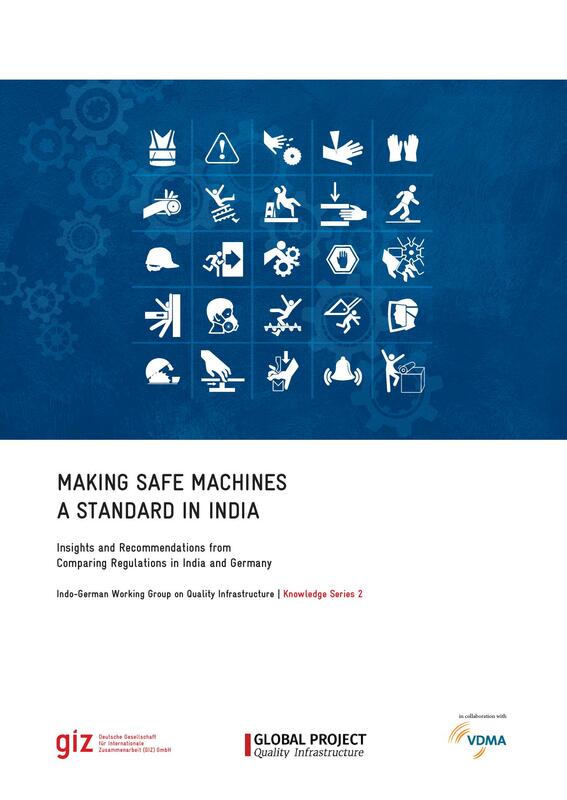 On 5 December, the German Federal Ministry for Economic Affairs and Energy (BMWi), the Indian Ministry of Consumer Affairs, Food & Public Distribution and the Indian Ministry of Labour and Employment came together in New Delhi to launch the publication Making Safe Machines a Standard in India. 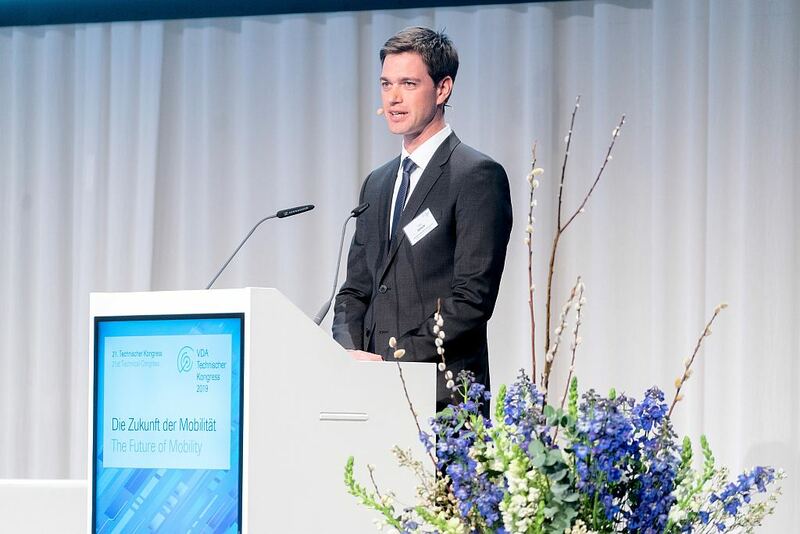 Within the framework of the event “quality connects”, the German Federal Ministry for Economic Affairs and Energy (BMWi) and the Indian Ministry of Consumer Affairs, Food & Public Distribution came together in New Delhi on 4 December. The focus of the event was the launch of an overview publication of India’s quality infrastructure landscape. Zur Vorbereitung der 6. Jahressitzung der Deutsch-Indischen Arbeitsgruppe Qualitätsinfrastruktur (QI) im Januar trafen sich rund 30 Vertreter*innen aus der Wirtschaft, Verbänden und QI-Institutionen am 19. November im Bundeswirtschaftsministerium (BMWi) in Berlin. Es wurde darüber diskutiert, welche Anliegen die Wirtschaft in den politischen Dialog mit indischen Ministerien einbringen möchte. Über die Auswirkungen des Regierungswechsels für deutsche Unternehmen diskutieren am 28. November in einem Webinar der Germany Trade & Invest (GTAI) drei Brasilien-Experten. German and Chinese companies are striving to develop new products and technologies that will shape the future of the building sector and support the transition towards a green construction industry. 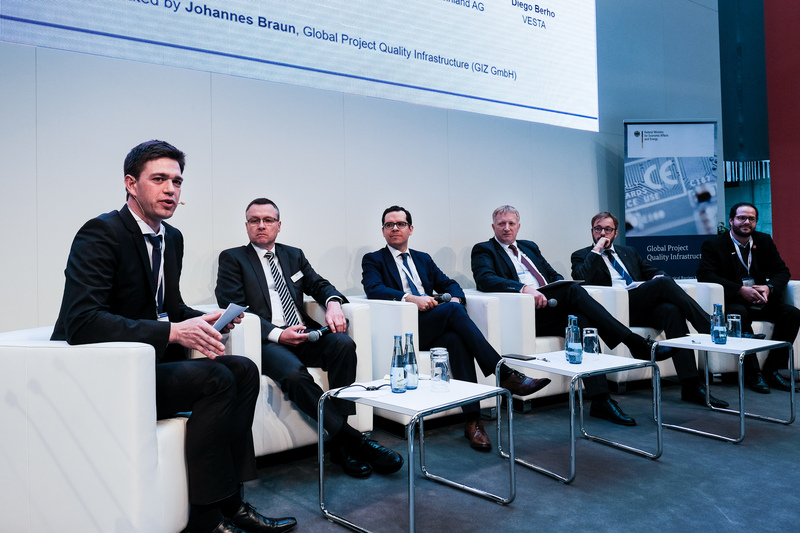 The question how quality infrastructure (QI) can facilitate this development was addressed in expert talks jointly organised by the Global Project Quality Infrastructure (GPQI) and Messe München GmbH on 1 November. The Indian Ministry of Electronics and Information Technology (MeitY) has released a draft National Policy on Electronics 2018 (NPE 2018) on 10 October. It underlines the high priority that the Government of lndia attaches to the electronics industry, which is also an important pillar of both the 'Make in India' and 'Digital India' programmes. Brasilien hat im August ein neues Bundesgesetz zum Schutz personenbezogener Daten verabschiedet, das Anfang 2020 offiziell in Kraft treten wird. Das brasilianische Datenschutzgesetz folgt im Wesentlichen den Vorgaben der EU-Datenschutzgrundverordnung. Präsentation von Boris Böhme, Referatsleiter Produkt- und Anlagensicherheit des Bundesministeriums für Wirtschaft und Energie (BMWi) im Rahmen eines BDI-Workshops zum Gesundheitsmarkt in China. Eine Delegation des chinesischen Handelsministeriums (MOFCOM) hat im Rahmen des Globalprojekts Qualitätsinfrastruktur vom 16. bis 22. September Deutschland und Brüssel besucht. Gemeinsamer Workshop des Bundesministeriums für Wirtschaft und Energie (BMWi) und des chinesischen Nationalen Amts für Medizinprodukteüberwachung (NMPA) zu aktuellen regulatorischen Schwerpunkten für Medizingeräte. The Brazilian Foreign Trade Council (CAMEX) has recently issued Brazil’s first Foreign Trade Regulatory Agenda. The Agenda serves as a regulatory planning instrument for 2018 and 2019 and shall assist the Federal Government in the identification and organization of strategic foreign trade regulations. It outlines existing laws and regulations that require review, amendment, update or revocation. Die Umstrukturierung der chinesischen Behördenlandschaft bringt Änderungen für die Deutsch-Chinesischen Dialoge zur Qualitätsinfrastruktur. 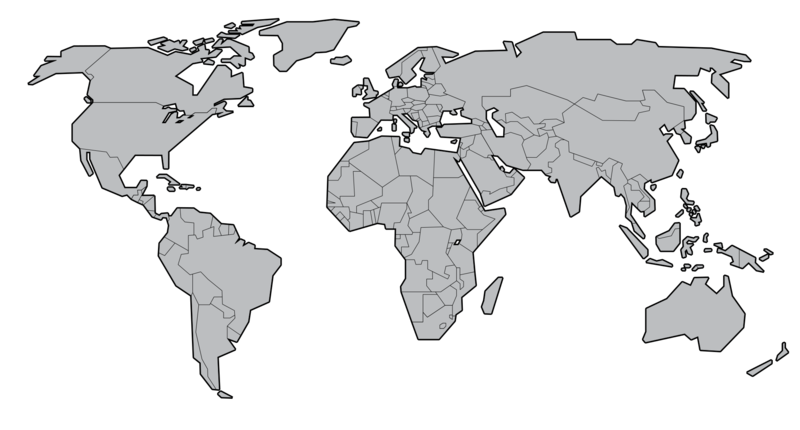 Strong exports can be a major driver of a country’s economic growth. Hence, India has set the goal of increasing its share of global trade and integrating more deeply into global value chains. India’s competitiveness in manufacturing and the success of ‘Make in India’ depend on its ability to produce high-quality products and services. Product quality is important for human health and consumer safety, as well as for protecting the climate and the environment. Vortrag von Hans-Georg Niedermeyer (ZLS) zum Thema Marktüberwachung im Rahmen der fünften National Standards Conclave in Neu-Delhi. The 5th Indian National Standards Conclave organised by the Department of Commerce of the Indian Ministry of Commerce and Industry took place on 18 and 19 June 2018 in New Delhi, India. Policy makers, industry representatives, and experts from related fields discussed the theme Implementing the Indian National Standards Strategy. India’s new standardisation strategy aims to position standards as a key driver of economic growth, supplementing national policies, and serving the interests of both consumers and the industry. Vom 27. bis 29. Mai fand die zweite Deutsch-Chinesische Kommission Normung (DCKN) unter dem Vorsitz des Bundesministeriums für Wirtschaft und Energie (BMWi) und dem Staatlichen Zentralamt für Normung der VR China (SAC) in Heidelberg statt. Am 16. Mai hat in Berlin die achte Jahressitzung der Deutsch-Chinesischen Arbeitsgruppe Produktsicherheit stattgefunden. Die Arbeitsgruppe (AG) tagte unter dem Vorsitz des Bundeswirtschaftsministeriums (BMWi) und des Amts für Zertifizierung und Akkreditierung der Volksrepublik China (CNCA). Bereits am Vortag hatten Workshops zu den Themen technische Innovation und Harmonisierung in der Automobilindustrie und zur Zusammenarbeit in der Konformitätsbewertung im Bereich IT-Sicherheit stattgefunden. Der Abbau technischer Handelshemmnisse zwischen Mexiko und Deutschland war Thema einer öffentlichen Experten-Diskussion, die am 26. April auf der Hannover Messe stattfand. Vorausgegangen war am Eröffnungstag der Hannover Messe am 23. April die Unterzeichnung einer gemeinsamen Absichtserklärung als Grundlage der künftigen Zusammenarbeit im Bereich Qualitätsinfrastruktur. Am 11. April hat in Mexiko-Stadt das erste High-Level Meeting des Deutsch-Mexikanischen Dialogs zur Qualitätsinfrastruktur stattgefunden. On 16 January 2018, the International Conference on Technical Barriers to Trade in the ICT Sector took place in Shenzhen, Guangdong Province. Together with some 270 participants, a delegation of the German Federal Ministry for Economic Affairs and Energy (BMWi), led by Mr Helge Engelhard, Deputy Director General (Standardisation and Safety), and Mr Boris Böhme, Division Director (Product and Plant Safety, Technical Harmonisation, Market Surveillance), attended. Am 15. und 16. Januar fand die fünfte Jahressitzung der Deutsch-Indischen Arbeitsgruppe Qualitätsinfrastruktur statt. Am 13. November hat die Gründungssitzung der Deutsch-Brasilianischen Arbeitsgruppe zur Qualitätsinfrastruktur stattgefunden. The 5th Plenary Meeting of Sino-German Sub-Working Group E-Mobility was held in Qingdao, China on June 28. More than 82 representatives from ministries, standardization bodies and industry from both, China and Germany, attended this meeting. The delegations were headed by Ms. Wang Li, Deputy General of Industrial Standards Department II of the Standardization Administration of PR China (SAC) and Mr. Rüdiger Marquardt, Member of the Board of the German Institute for Standardization (DIN). Mr. Yin Minghan, Vice Administrator of SAC and Dr. Thomas Zielke, Head of Division Technology Transfer through Standardisation and Patents, Questions of Principle in Standardisation and Patent Policy of BMWi attended the meeting. On 12 April 2017, the 7th Annual Meeting of the Sino-German Working Group on Product Safety took place in Hangzhou. The meeting was chaired by Mr. Stefan Schnorr, Director General (DG) of Digital and Innovation Policy Department of the Federal Ministry for Economic Affairs and Energy (BMWi) and by Mr. Sun Wenkang, Director General of Inspection and Supervision Department of the General Administration of Quality Supervision, Inspection and Quarantine of the People’s Republic of China (AQSIQ), as well as by Mr. Liu Weijun, Deputy Director of Certification and Accreditation Administration of the People’s Republic of China (CNCA). The workshop on “Recall Procedures and Risk Management” of the Sino-German Sub-Working Group (SWG) on Product Safety in the Automotive Industry took place on the 11th of April 2017 within the framework of the Sino-German Working Group on Product Safety. In the run-up to the 7th Annual Meeting of the German-Chinese Working Group on Product Safety, a roundtable on the current development and implementation of ecological product certification in China (China Green Product Certification) took place on 11 April 2017. On the 11th of April, 2017 the workshop in project line “Technical Innovation” and “Technical Harmonization” of the Sino-German Sub-Working Group (SWG) on Product safety in the Automotive Industry took place within the framework of the Sino-German Working Group on Product Safety. Within the framework of the seventh annual meeting of the Sino-German Working Group on Product Safety held in Hangzhou in April 2017, the Deutsche Gesellschaft für Internationale Zusammenarbeit (GIZ) GmbH has organised a technical side workshop on market surveillance measures in cross-border online trading. 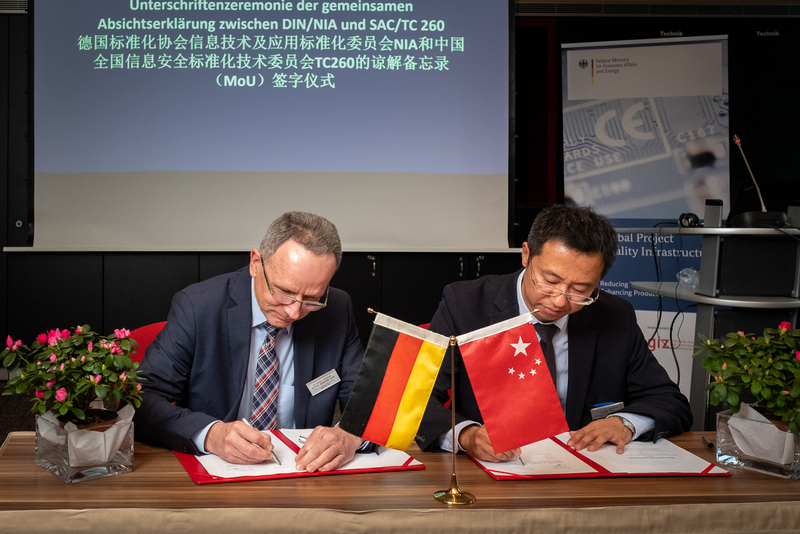 On 31 March 2017, the German Accreditation Service (DAkkS) and the China National Accreditation Service (CNAS) decided to establish a bilateral cooperation within the framework of the Sino-German Working Group on Product Safety. 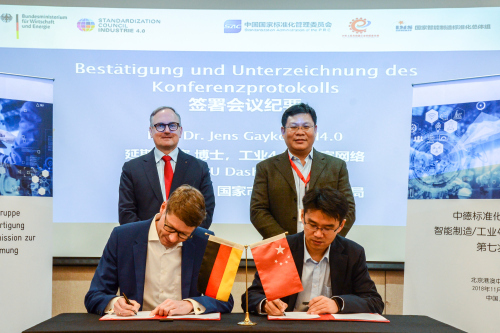 In March 2017, the Deutsche Gesellschaft für Internationale Zusammenarbeit (GIZ) GmbH has organised a symposium on the legal and regulatory framework for e-commerce in China, commissioned by the German Federal Ministry of Economics and Energy (BMWi). Representatives from politics, business and science were invited to participate in the information and discussion event held in Berlin. Viertes Treffen der Deutsch-Indischen Arbeitsgruppe Qualitätsinfrastruktur in Berlin. On 19 January, the 19th Roundtable on Product Safety in China took place at the Swiss Embassy in Beijing. A delegation from the Chinese Ministry of Commerce (MOFCOM) visited Germany and Brussels from the 14th to 18th of November to gather information on the structuring of the automotive market and the legislation on circulation of goods in the automotive industry in Germany and the EU. As part of China’s long-term national development strategy towards an ecologically sustainable economy, the State Council has mandated the Certification and Accreditation Administration of the PRC (CNCA) to develop and implement a new certification and labelling system for green products. On the 25th of October, the Bundesanstalt für Materialforschung und –prüfung hosted the BAM-CCAI Expert Workshop on Sino-German Cooperation in the area of Conformity Assessment and Accreditation in Berlin. From the 19th to the 23rd of September, Dr. Bertram Reindl, Landesamt für Gesundheit und Lebensmittelsicherheit (LGL) and Ms. Milena Funk, Deutsches Referenzbüro für Ringversuche & Referenzmaterialien (DRRR) visited Beijing within scope of the Sino-German cooperation on Proficiency Testing (PT). The second product safety day was held on the 22nd and 23rd of August in Shanghai, due to the immense importance of the Chinese market for the automotive industry. A workshop on import inspection procedures in China and Germany was held in Tianjin on the 22nd of August. On 30 June 2016, Ms. Dr. Ines Oehme from the German Federal Environmental Agency (UBA) presented at a conference on the development of the new eco-labeling and certification-system “China Green Product Certification” in Hangzhou. On 20 June, the 18th Roundtable on Product Safety in China took place at the offices of GIZ China in Beijing. On 15th and 16th June, 2016 representatives from the German Federal Ministry for Economic Affairs and Energy (BMWi) and the German Federal Ministry of Justice and Consumer Protection (BMJV) participated in an international government symposium on e-commerce legislation in Shanghai. On Tuesday, 14 June 2016, government and private sector representatives met to discuss regulatory and legislative conditions for cross-border e-commerce in China. On 24 May 2016, the 6th Annual Meeting of the Sino-German Working Group on Product Safety is going to take place in Berlin. Anlässlich eines Workshops im Rahmen der Unterarbeitsgruppe (UAG) Produktsicherheit in der Fahrzeugindustrie trafen deutsche und chinesische Experten am 18 März 2016 unter Vorsitz des chinesischen Nationalen Zertifizierungsamtes (CNCA) und des deutschen Bundeswirtschaftsministeriums (BMWi) in Shanghai zusammen. Anlässlich eines Workshops im Rahmen der Deutsch-Chinesischen Arbeitsgruppe (AG) Produktsicherheit trafen deutsche und chinesische Experten am 16. März 2016 unter Vorsitz des chinesischen Nationalen Zentralamtes für Qualitätsüberwachung, Inspektion und Quarantäne (AQSIQ) und des deutschen Bundeswirtschaftsministeriums (BMWi) in Peking zusammen. On 15 March 2016, the General Administration for Quality Supervision, Inspection and Quarantine (AQISQ) and the Federal Ministry for Economic Affairs and Energy (BMWi) jointly held the constituting workshop for the Sub-Working Group on Product Safety of Bilaterally Traded Medical Devices in Beijing. On 26 November 2015, Chinese and German experts came together to a bilateral workshop in Hangzhou chaired by BMWi and CNCA to discuss two project lines of the Sub-Working Group for Product Safety in the Automotive Industry. Breakthroughs were achieved in both project lines, “Technical Innovations” (PL1) and “Technical Harmonization” (PL3). On 23 October 2015, the General Administration for Quality Supervision, Inspection and Quarantine (AQSIQ) and the Federal Ministry for Economic Affairs and Energy (BMWi) jointly hosted a workshop in Beijing on import inspection requirements for medical devices. On 23 October 2015, the third expert workshop of the project line on safety labelling for industrially used products took place in Beijing in the presence of representatives of the Federal Ministry for Economic Affairs and Energy (BMWi) and the General Administration for Quality Supervision, Inspection, and Quarantine (AQSIQ). During a an official delegation visit of the German Ministry of Economic Affairs and Energy (BMWi) to Beijing, a dialogue with the Ministry for Public Security (MPS) of the PRC on product requirements in the security industry was initiated, which had been anticipated for a long time by German industry representatives. On 22 October 2015, the Sino-German Workshop on the draft Commodity Circulation Law (Domestic Trade Law) was jointly hosted by the Ministry of Commerce of People’s Republic of China (MOFCOM) and the German Federal Ministry for Economic Affairs and Energy (BMWi) in Beijing. On the 20th and 21st of October 2015, German and Chinese experts met in the premises of the Guangdong Inspection and Quarantine Technology Center (IQTC) in Guangzhou to discuss about how to proceed with the joint research of a screening method for Chromium VI as well as the joint development of reference materials. 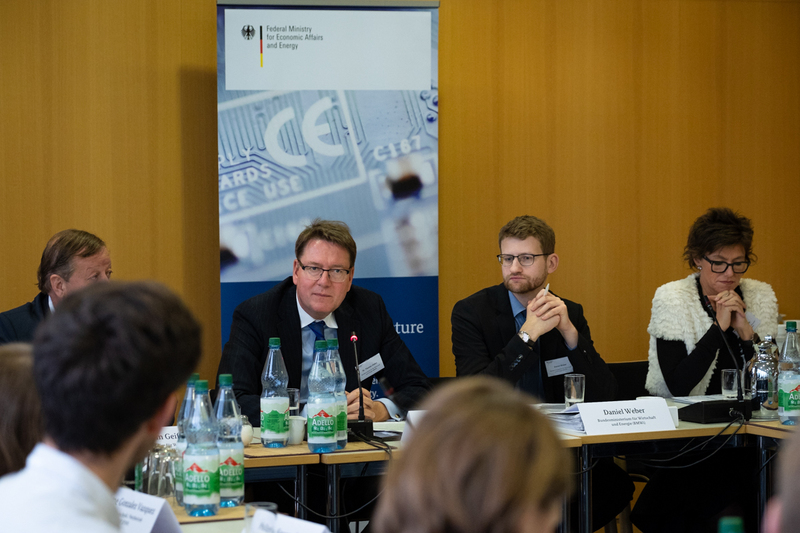 On 10 September 2015, the Federal Ministry for Economic Affairs and Energy (BMWi) and the General Administration for Quality Supervision, Inspection and Quarantine (AQSIQ) jointly organized a workshop on market surveillance of e-commerce in Berlin. The event took place as part of an AQSIQ delegation trip headed by the Department for Inspection Supervision. On 29 July 2015, the Chinese General Administration for Quality Supervision, Inspection and Quarantine (AQSIQ) and the German Federal Ministry for Economic Affairs and Energy (BMWi) jointly organized an expert workshop on the topic of “Parallel Imports and Recall Systems of Vehicles”. From 15 to 19 June 2015, a delegation from various technical departments of the Chinese Ministry of Commerce (MOFCOM) visited Europe. The objective of the trip was to gather information about measures to monitor product safety in e-commerce and to discuss current developments with their German partners. On 15 May 2015, a meeting between the German Federal Ministry for Economic Affairs and Energy (BMWi) and the Ministry of Commerce of the People’s Republic of China (MOFCOM) was held in Beijing. On 15 May 2015, a half-day roundtable dealing with the Chinese reform of the conformity assessment system and resulting implications for German industry took place in Beijing. Along with the lively discussion on the ongoing reform, the industry representatives also exchanged opinions on further Sino-German cooperation possibilities in the field of conformity assessment. Accompanied by QI-members, Dr. Norbert Schultes, head of the Accreditation, Conformity Assessment, Metrology, Supervision PTB and BAM Department of the German Federal Ministry of Economic Affairs and Energy (BMWi), visited the Chinese Certification and Accreditation Institute (CCAI) on behalf of the German Federal Institute for Materials Research and Testing (BAM) on 15 May 2015. On 14 May 2015, the fifth annual meeting of the Sino-German Working Group on Product Safety took place at the General Administration of Quality Supervision, Inspection and Quarantine of the People’s Republic of China (AQSIQ) in Beijing. Chaired by Department Head Sun Wenkang (Department of Supervision on Inspection, AQSIQ) and Deputy Head Liu Weijun (Certification and Accreditation Administration of the People’s Republic of China, CNCA), results of the Sino-German cooperation on product safety were discussed with Department Head Dr.Wolfgang Scheremet (Industrial Policy, BMWi). On 11 May 2015, the first annual meeting of the Subworking Group on Product Safety in the Automobile Industry took place at the Chinese General Administration of Quality Supervision, Inspection and Quarantine (AQSIQ) in Beijing. In the context of the Sub Working Group on Product Safety in the Automotive Industry, a delegation visit of the General Administration of Quality Supervision, Inspection and Quarantine of the People’s Republic of China (AQSIQ), the Certification and Accreditation Administration of the People’s Republic of China (CNCA), the China Quality Certification Centre (CQC) and further specialised institutions to Germany and Brussels took place from 20 to 24 April 2015. On 27 March 2015, the 3rd Expert Workshop on Harmonisation of Testing and Certification Procedures for Toy Products took place in Munich. On 26 March 2015, a Chinese delegation composed of members from CNCA and CQC took a study visit to ZLS in Munich to acquaint themselves with management mechanisms and the set up of the GS scheme. On 16 March 2015, the first Expert Workshop for the Mutual Recognition of Tests Reports took place in Beijing to promote the mutual recognition of test reports as well as the harmonisation of conformity assessment procedures. On 9 March 2015, representatives of German industry, politics and academia met for a half-day Private Sector Roundtable on “Industrie 4.0” at Kempinski Hotel Lufthansa Center in Beijing. 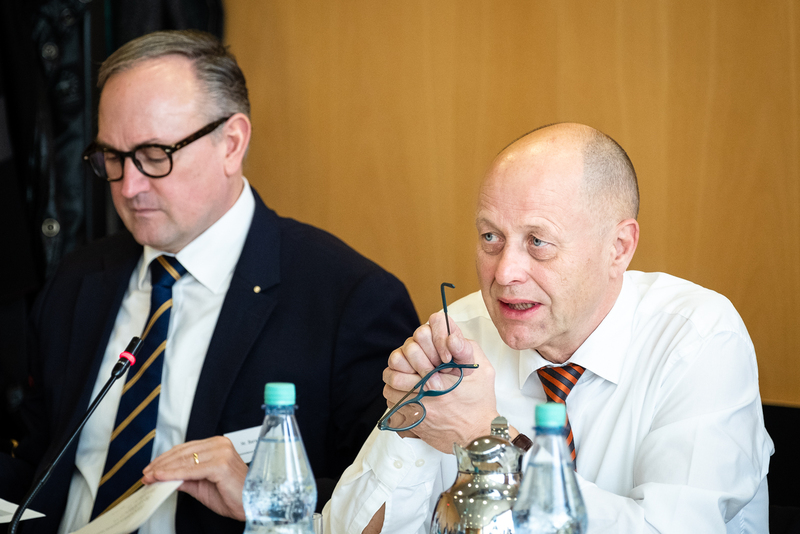 On 12 January 2015, German and Chinese experts gathered in Frankfurt to discuss the next steps in the harmonization of safety labelling of B2B products. On 5 December 2014, German and Chinese experts gathered in Beijing to discuss challenges in the development of reference material. On 4 December 2014, the Federal Ministry of Economic Affairs and Energy (BMWi) and the General Administration of Quality Supervision, Inspection and Quarantine (AQSIQ) hosted an Expert Hearing on “China (Shanghai) Free Trade Zone: Impact of Current Import Inspection and Certification Reforms on German Companies“ in Waigaoqiao, Shanghai. The second expert workshop on conformity assessment in the toy industry was held in Beijing on 3 December 2014 hosted by the Chinese Certification and Accreditiona Administration (CNCA) and the German Federal Ministry for Economic Affairs and Energy (BMWi). On 2 December 2014, the Ministry of Commerce of the People’s Republic of China (MOFCOM) and the German Federal Ministry for Economic Affairs and Energy (BMWi) jointly hosted a symposium about the legal framework and organization of market surveillance in China and Germany. On 5 and 6 November, the Certification and Accreditation Administration of the People’s Republic of China (CNCA) and the German Federal Ministry for Economic Affairs and Energy (BMWi) hosted the a technical exchange and training seminar on Good Laboratory Practices (GLP) in Guiyang. From 25 to 1 November 2014, representatives of the Certification and Accreditation Administration of the People’s Republic of China (CNCA) and the Research Institute of Chemical Industry (SRICI) traveled to Germany on a study tour organized by the QI Project. On 14 October 2014, the third expert workshop on Potentials on Mutual Recognition of Test Reports and Harmonization of Certification Procedures took place in Shanghai. On 13 October 2014, a workshop on “Certification of Surge Protection Devices (SPD)” took place in Shanghai. During a reception at the Ministry of Commerce of the Peoples Republic of China (MofCom) on 19 September 2014, Director General Dr. Sven Halldorn (Federal Ministry of Economic Affairs and Energy of the Federal Republic of Germany, Dept. Industrial Policy) and Director General Li Chenggang (MofCom, Dept. Treaty and Law) agreed on a Joint Declaration that emphasizes the wish of both ministries to intensify bilateral exchange in legal and political aspects of market surveillance. During the annual meeting of the Sino-German Working Group on Product Safety in June 2014, the German Federal Ministry for Economic Affairs and Energy (BMWi) and the Chinese General Administration of Quality Supervision, Inspection and Quarantine (AQSIQ) agreed to answer to recent challenges in the trade of automotive products by setting up a sub-working group on product safety in the automotive industry. From the 15 to 17 September, representatives of the Federal Ministry of Economical Affairs and Energy (BMWi) and the German automotive industry visited the Inspection and Quarantine Bureau (CIQ) in Shanghai to exchange on latest developments in import and export of cars and components. On 19 August 2014, a roundtable discussion on the impact of AQSIQ export inspection reforms on businesses was held in Beijing. The 1st tender of the Private Sector Fund in 2014 has started! We welcome all interested private sector companies and organizations to submit their project proposals until 30 June. On Tuesday, 24 June, 2014, the German Federal Ministry for Economic Affairs and Energy (BMWi) and the Certification and Accreditation Administration of the People’s Republic of China (CNCA) jointly organized a seminar on the certification of energy management systems following the fourth annual meeting of the Working Group Product Safety in Berlin. The QI Project has commissioned a study on analyzing the policy changes in Chinese quality infrastructure in March 2014. The fourth annual meeting of the Sino-German Working Group on Product Safety took place on 23 June, 2014 at the Federal Ministry for Economic Affairs and Energy in Berlin. On 20 June 2014, representatives of the Federal Ministry of Economic Affairs and Energy (BMWi), the Certification and Accreditation Administration or the P.r: China (CNCA), the German Association of the Toy Industry (DVSI) and representatives of German toy companies and testing and certification institutes met in Berlin at the invitation of BMWi and the Sino-German Quality Infrastructure Project to attend a planning workshop for the project´s core topics. In May and June 2014, two consecutive events on the GS scheme (“safety tested”) took place in Beijing. On 30 May 2014, the 2nd workshop on Potentials for Mutual Recognition of Test Reports and Harmonization of Conformity Assessment Procedures between Germany and China was held in Beijing. On the occasion of a series of events from 5 to 9 May 2014, representatives of the Federal Ministry of Economic Affairs and Energy (BMWi), the General Administration of Quality Supervision, Inspection and Quarantine of the People’s Republic of China (AQSIQ), the German Central Authority for Safety of the Länder (ZLS) and the local market surveillance authorities of the provinces Sichuan, Shenzhen and Guangdong discussed the basic aspects of the legislation and the execution of market surveillance in Germany and China. On 1 April 2014, a workshop on “Testing methods of determination of Chromium VI content” was held in Berlin hosted by the German Federal Ministry of Economic Affairs and Energy (BMWi) as a part of a study tour about requirements for reference materials. The Quality Infrastructure Project deals with a common definition of the requirements on reference materials of inorganic elements in toys for Germany and China. From 12 March to 13 March 2014, the Federal Ministry of Economic Affairs and Energy (BMWi) and the Central Administration of Quality Supervision, Inspection and Quarantine of the People’s Republic of China (AQSIQ) were jointly invited to an expert workshop on product labels of industrially used products in Nanjing. 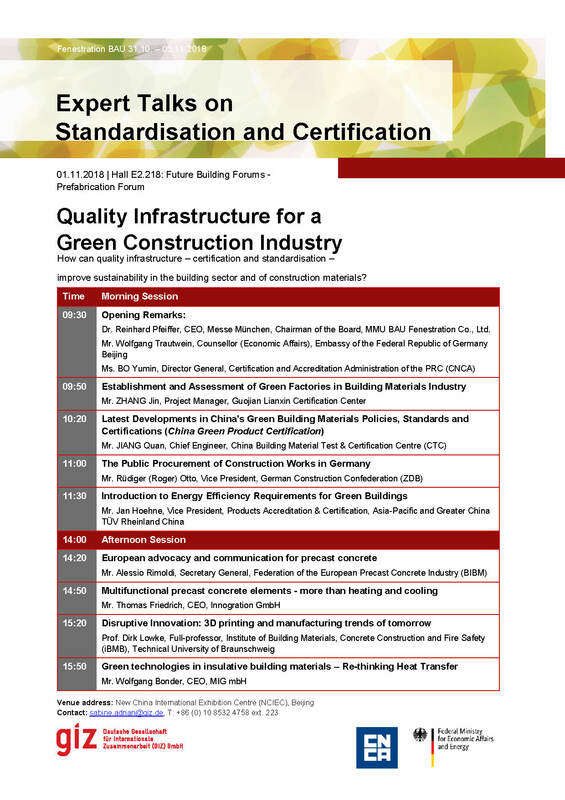 On 11 March 2014, the Sino-German Quality Infrastructure (QI) Project has invited to a roundtable meeting with industry experts on “Post 3rd Plenum Impacts on Production Conditions and Market Access”. On 21 February 2014 representatives of the German Association of the Toy Industry (DVSI), German toy companies as well as testing and certification institutions met in Hamburg at invitation of the Federal Ministry of Economic Affairs and Energy (BMWi) and GIZ for a planning workshop to investigate two thematic priorities of the Quality Infrastructure Project involving the toy industry. On 31 January 2014, the Federal Ministry of Economic Cooperation and Development (BMZ) invited to the workshop “Material Management, the easy way!” as part of the Toy Fair in Nuremberg. On 30 January 2014, the German Electrical and Electronic Manufacturers’ Association (ZVEI) hosted an expert workshop in Frankfurt to promote the dialogue with the China Quality Certification Center (CQC) on certification of surge protection devices (SPDs). Representatives of the German Federal Ministry of Economics and Technology of the Federal Republic of Germany (BMWi) and the General Administration for Quality Supervision, Inspection and Quarantine of the People’s Republic of China (AQSIQ) visited three Chinese provinces from Tuesday, 15 October to Friday, 18 October 2013 to inform the local authorities about latest developments in market surveillance regulations in both countries. On Monday, 14 October 2013, the German Federal Ministry of Economics and Technology of the Federal Republic of Germany (BMWi) and the General Administration of Quality Supervision, Inspection and Quarantine of the People’s Republic of China (AQSIQ) jointly organized a workshop on the new EU Market Surveillance and Product Safety Directive in Beijing. On 13 September 2013, the German Federal Ministry of Economics and Technology (BMWi) and the Certification and Accreditation Administration of the People’s Republic of China (CNCA) have co-hosted a workshop in Berlin to elaborate on the potentials for mutual recognition of test reports between Germany and China. From Tuesday, 13 August to Friday, 16 August 2013, the project line on Good Laboratory Practice (GLP) for chemical substances has started with trainings and laboratory visits in Shanghai and Ningbo. On 7 June 2013, the Federal Ministry of Economics and Technology of the Federal Republic of Germany (BMWi), Directorate-General for Enterprise and Industry of the European Commission (DG ENTR) and the General Administration of Quality Supervision, Inspection and Quarantine of the People’s Republic of China (AQSIQ) have jointly hosted a symposium on EU Machinery Directive in Shanghai. On 6 June 2013, the Sino-German Working Group on Product Safety convened its 3rd annual plenary meeting in Shanghai to review its achievements over the past year and map out future plan of cooperative projects for strengthening cooperation in the field of product safety between China and Germany.